Hello crochet friends! Hannah here. For the past few months I’ve been wanting to experiment with different stitches to create some alternating textures and my mom suggested that I try using Bernat Blanket yarn. I’d never used it before this blanket and I wasn’t sure at first if I was going to like it, but I love how soft and squishy it turned out! Half Double Crochet – YO (yarn over), insert your hook, pull up a loop, YO, pull through all three loops. Single Crochet – Insert your hook, pull up a loop, YO, pull through both loops. Slip Stitch – Insert your hook, pull up a loop, pull directly through loop. *Please note that in the video my mom is putting single crochets in between her berry stitches, and for this blanket I chose to put slip stitches in between my berry stitches to help them pop out more. Chain 65 (or any odd number). ROW 2-5: Work 4 more rows of HDC, but this time work in between the posts of the stitches below. Continue to chain 1 when you turn at the end of each row. ROW 6: Work a slip stitch into the first stitch, then work a berry stitch into the next stitch (continue inserting your hook in between the posts). Continue alternating a slip stitch with a berry stitch until you reach the end of the row. Chain 1 and turn. ROW 7: Work a single crochet (SC) into the top of every stitch across the row. Chain 1 and turn. ROW 11: Work 1 row of HDC into each stitch across the row. Chain 1 and turn. ROW 12-15: HDC for 4 more rows (working in between the posts), chaining 1 and turning at the end of each row. Repeat rows 6 through 15 until you reach your desired length. When you finish the blanket, weave in any ends with a tapestry needle. Because the stitches switch back and forth throughout the blanket, the sides of my blanket turned out a little wavy, so I worked a simple single crochet border around the edges to make them straight. To add the border, pull up a loop in any corner and chain one, then single crochet around each side of the blanket, working 3 SCs into each corner. When you reach the corner you started with, slip stitch into the starting stitch and tie off. Thank you so much for coming to see this pattern! I hope you enjoy making this blanket! My mom and I love to share what we are making as we try to keep improving our crochet skills. We love that we’ve been able to meet so many wonderful crochet friends through this blog! 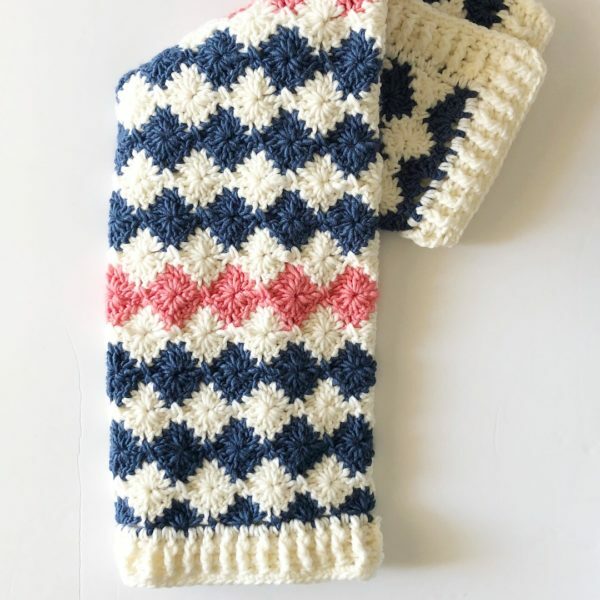 If you’re looking for some more baby girl blanket ideas, I’ve put some links to some of our favorite patterns below :). When you finish your project, please come share a picture with us on Facebook or Instagram using #daisyfarmcrafts, we’d love to see and share your work!